I participated in the building of the Xof1 Solar Car which now holds many records for overall distance, longest distance in one day, and notable accomplishments like the first solar car on ice, first solar car in the arctic. I have been asked to post pictures that I have from the project since many of the original photos that Marcelo took during the build were lost in a burglary. 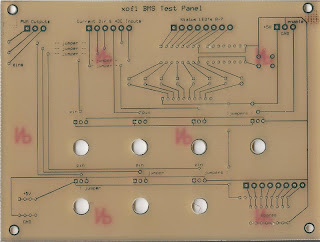 Anyway, this is a scan of a PCB that was made early on. Xof1's batteries were giant sized lithium ion polymer batteries from Kokam which theoretically needed a battery management system to control charge and discharge and to keep a watch on temperature. Temperature especially since the last thing you want is to be enclosed in a tiny space with a lithium battery fire. This PCB was either designed by Mario Bilusic or maybe John Visosky, and probably made my John. The design of an effective BMS is very difficult. This board was an early experiment and looks nothing at all like later versions of the BMS since many requirements were discovered over the two or three years that the BMS was worked on. The approach in use for this board looks like a PIC microcontroller running some MOSFETs using PWM, based in input from a current sensor to control 7 batter packs... I understand that in the end Marcelo operated xof1 well within the batteries limitations and that the batteries performed better than expected and for longer than expected.